Chavez is frequently shafted in the Western media, who allege that the only reason the Venezuelan economy is doing well is because of record oil prices. This is not to mention all the invective hurled against the Chavez administration for its supposed disrespect for democracy, from refusing to renew the licenses of TV stations support foreign-sponsored coup attempts against him (while ignoring human rights violation in friendly countries in the region like Colombia, where more union workers are killed annually in than in the rest of the world combined) to the latest smear job by the Economist about crime. But let’s focus on the economic-boom-is-because-of-oil mantra. Having disproved similar claims about Russia, I decided to investigate this further. Novel Prize winning economist Stiglitz has praised Venezuela’s economic policies. And I found this excellent paper, Update: The Venezuelan Economy in the Chávez Years by Mark Weisbrot and Luis Sandoval from 2008. I’ve quoted its main findings. 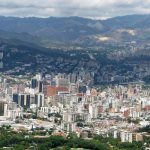 Venezuela has experienced very rapid growth since the bottom of the recession in 2003, and grew by 10.3 percent in 2006 and about 8.4 percent last year. The most commonly held view of the current economic expansion is that it is an “oil boom” driven by high oil prices, as in the past, and is headed for a “bust.” The coming collapse is seen either as a result of oil prices eventually declining, or the government’s mismanagement of economic policy. There is much evidence to contradict this conventional wisdom. Venezuela suffered a severe economic growth collapse in the 1980s and 1990s, with its real GDP peaking in 1977. In this regard it is similar to the region as a whole, which since 1980 has suffered its worst long-term growth performance in more than a century. Hugo Chávez Frías was elected in 1998 and took office in 1999, and the first four years of his administration were plagued by political instability that had a large adverse impact on the economy. (See Figure 2). This culminated in a military coup that temporarily toppled the constitutional government in April 2002, followed by a devastating oil strike in December 2002-February 2003. The oil strike sent the economy into a severe recession, during which Venezuela lost 24 percent of GDP. 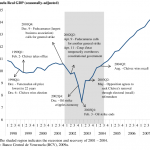 But in the second quarter of 2003, the political situation began to stabilize, and it has continued to stabilize throughout the current economic expansion. The economy has had continuous rapid growth since the onset of political stability. Real (inflation-adjusted) GDP has grown by 87.3 percent since the bottom of the recession in 2003. It is likely that the government’s expansionary fiscal and monetary policies, as well as exchange controls, have contributed to the current economic upswing. Central government spending increased from 21.4 percent of GDP in 1998 to 30 percent in 2006. Real short-term interest rates have been negative throughout all or most of the recovery (depending on the measure—see Figure 4). conservatively with respect to oil prices: for example, for 2007, the budget planned for oil at $29 per barrel, compared to an average price of $65.20 dollars per barrel for Venezuelan crude last year. The government has typically exceeded planned spending as oil prices come in higher than the budgeted price, so it is possible that spending would be reduced if oil prices decline. average savings of 27 percent and 39 percent compared to market prices in 2005 and 2006, respectively). The poverty rate has been cut in half from its peak of 55.1 percent in 2003 to 27.5 percent in the first half of 2007, as would be expected in the face of the very rapid economic growth during these years. (See Table 3). If we compare the pre-Chávez poverty rate (43.9 percent) with the first half of 2007 (27.5 percent) this is a 37 percent drop in the rate of poverty. However this poverty rate does not take into account the increased access to health care or education that poor people have experienced. The situation of the poor has therefore improved significantly beyond even the substantial poverty reduction that is visible in the official poverty rate, which measures only cash income. Inflation itself is a problem, now running at 22.5 percent. But it should be emphasized that double-digit inflation rates in a developing country such as Venezuela are not comparable to the same phenomenon occurring in the United States or Europe. Inflation in Venezuela was much higher in the pre Chávez years, running at 36 percent in 1998 and 100 percent in 1996. It has fallen through most of the current recovery, from 40 percent annual rate (monthly, year-over-year) at the peak of the oil strike in February 2003 to 10.4 percent in May 2006, before climbing again to its present rate (see Figure 3). Because of its large current account surplus, large reserves, and low foreign debt, the government has a number of tools available to stabilize and reduce inflation – as well as eventually bring the currency into alignment – without sacrificing the growth of the economy. It appears the government is committed to maintaining a high rate of growth, in addition to its other goals. Venezuela is also well-situated to withstand negative external shocks, including a likely U.S. recession or even a serious global slowdown, a significant drop in the price of oil, and problems in the international credit and financial system. Therefore, at present it does not appear that the current economic expansion is about to end any time in the near future. 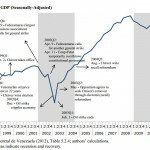 In sum, the performance of the Venezuelan economy during the Chávez years does not fit the mold of an “oil boom headed for a bust.” Rather it appears that the economy was hit hard for the first few years by political instability, and has grown rapidly since the political situation stabilized in the first quarter of 2003. High oil prices have certainly contributed to this growth, as has the government’s expansionary fiscal and monetary policy. Containing and reducing inflation, as well as realigning the domestic currency, appear to be the most important challenges in the intermediate run; in the long run, diversifying the economy away from its dependence on oil is also a major challenge. that it would sharply curtail economic growth in order to bring down inflation, as is often done. This is especially true since it has not exhausted other alternatives. Venezuela is also well-situated to withstand negative external shocks, including a likely U.S. recession or even a serious global slowdown, a significant drop in the price of oil, and problems in the international credit and financial system. Therefore, at present it does not appear that the current economic expansion is about to end any time in the near future. The gains in poverty reduction, employment, education and health care that have occurred in the last few years are likely to continue along with the expansion. 1. Yes, Venezuela has become more oil-intensive as measured by its (nominal) GDP figures during Chavez’ rule. However, this is because oil has exploded in price. In real terms, oil production has actually been in decline and a weight on GDP growth; the biggest growth, by sector, was in construction, mining, utilities, retail, finance, transport and communications. I.e., pretty much everything except oil. 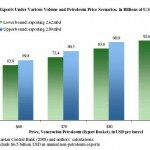 As put by the Council on Foreign Relations, “critics of Chavez think he should be pouring money into infrastructure to ensure a sustainable oil industry rather than allocating so much for social and foreign policy initiatives.” While that is certainly in American and oil-importing countries’ interests, that does not apply to ordinary Venezuelans. But that’s beside the point, because the reason Venezuelan oil production is in decline is not that the state-owned oil company, PDVSA, has been supposedly stuffed by incompetent Bolivarian ideologues, burdened by non-oil related social and industrial obligations and had its share increased in “strategic associations” (between PDVSA and foreign companies) from 40% to 60%. While the three above factors have played apart, it all ultimately comes down to peak oil. All the big discoveries were made before 1960 (which led to the first oil peak in 1970) and, with the exception of a small blip in the mid-1980’s (which, together with modernization and deregulation led to the second oil peak in the late 1990’s), have now ceased. 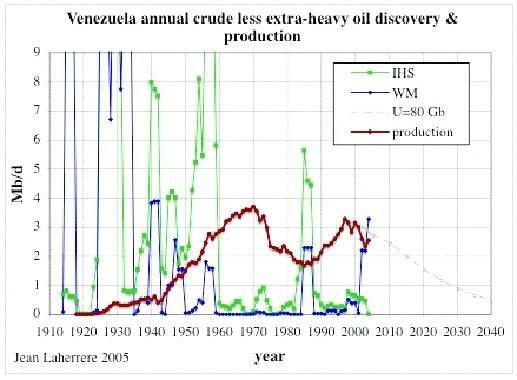 And from now on it is predicted Venezuela’s oil production will be in continuous, relentless decline, following in the footsteps of countries like the US itself. As an aside, the Orinoco fields are not a solution. The only place in the world where heavy oil refining is a major enterprise are the tar sands in Canada, which have not delivered impressive results despite the huge amounts of fresh water, natural gas and capital expended on them. 2. The most comprehensive (and non-hysterical) critique of Chavez is An Empty Revolution: The Unfulfilled Promises of Hugo Chávez by Francisco Rodríguez, who worked for a time Consolidated Social Fund, clashed with the administration and was eventually ousted. A condensed version was reprinted in the IHT. He attacks the root of the Chavistas’ claims to superiority, claiming that ‘the “Chávez is good for the poor” hypothesis is wrong’. Basically, he suggests that even in those areas where things didn’t get worse (scarcities, access to running water, percentage of underweight babies, wealth unequality, etc), poverty reduction, illiteracy, infant mortality and spending on education and housing would not have been any worse without his presence. In other words, the oil windfall was mismanaged. 3. On the other hand Weisbrot immediately wrote a (convincing) rebuttal of the above claims in An Empty Research Agenda: The Creation of Myths About Contemporary Venezuela, showing most of those claims to be either half-truths or outright falsehoods.